After a taste of Southern hospitality from Skanska and their executives in Florida, Georgia, and North Carolina, the tour headed north to meet with friends in DC Stampede. As a short detour, we decided to make a visit to the headquarters of Skanska Infrastructure Development (ID) in Alexandria, VA. This is one of Skanska’s biggest regional offices and home to one of their four main revenue streams in the United States. They weren’t expecting us, so we chose to make our presence known in the most surprising way possible. We entered their office complex and stormed through the lobby to reach their doors on the first floor. They locked them and in response we held a noise demonstration in the lobby on the other side of their glass. 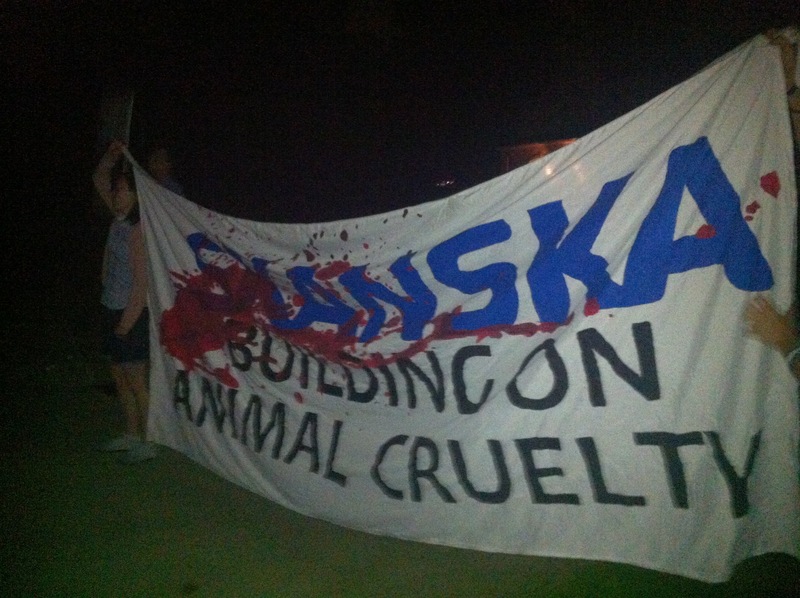 A crowd of employees from the surrounding offices gathered as Skanska was outed for their involvement in animal abuse. 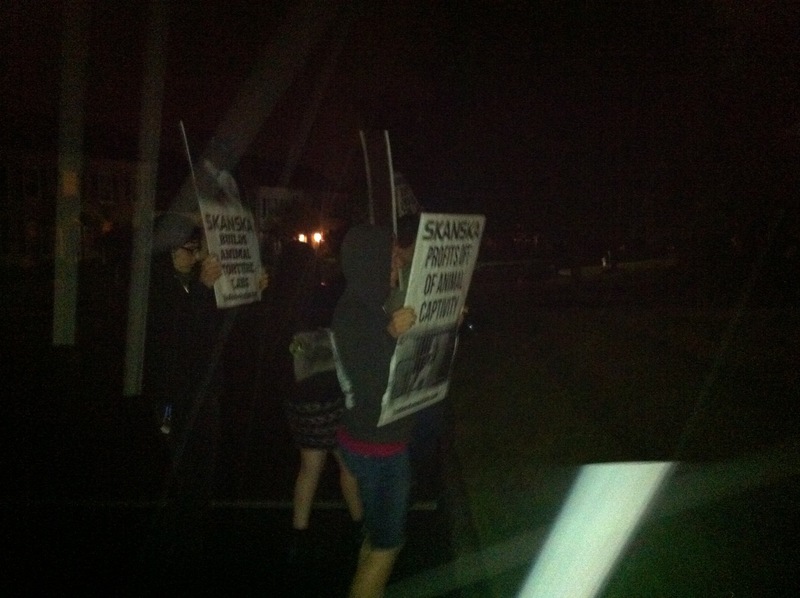 Luckily, we left plenty of information should they take interest in shaming Skanska. That evening DC Stampede hosted us for a presentation and discussion about the campaign. They have been handling local organizing in the DC area, so this was a good opportunity to strategize for the community. After the presentation group headed out to the home of Stephen Skinner, Executive Vice President and General Manager for the DC office, at 47767 Mariner Ct., Sterling, VA. 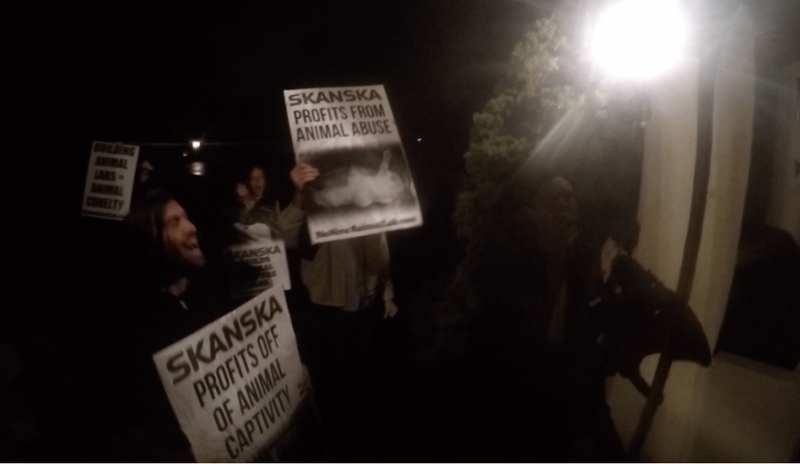 When we arrived, the neighborhood was quiet and houses had their lights out, so we went right to his front door to protest and expose him to the neighborhood. 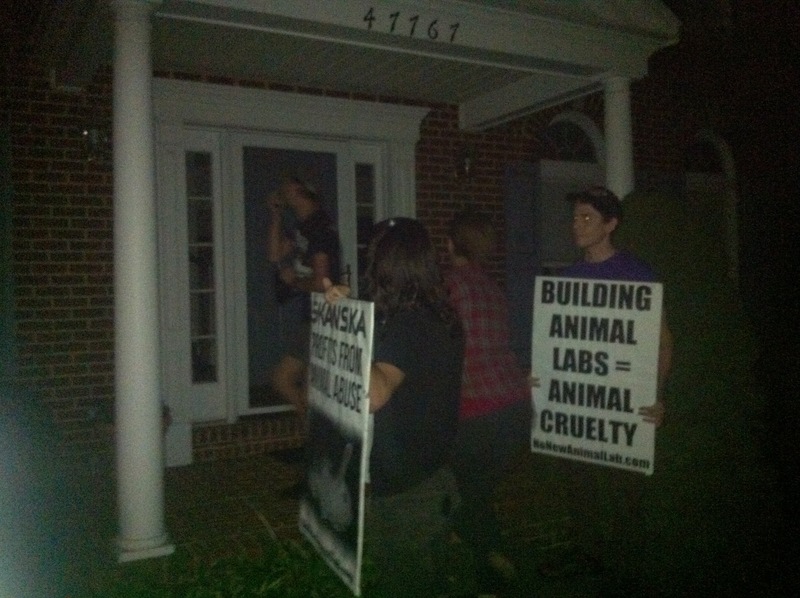 Neighbors assembled outside and made it clear that they knew why we were there. 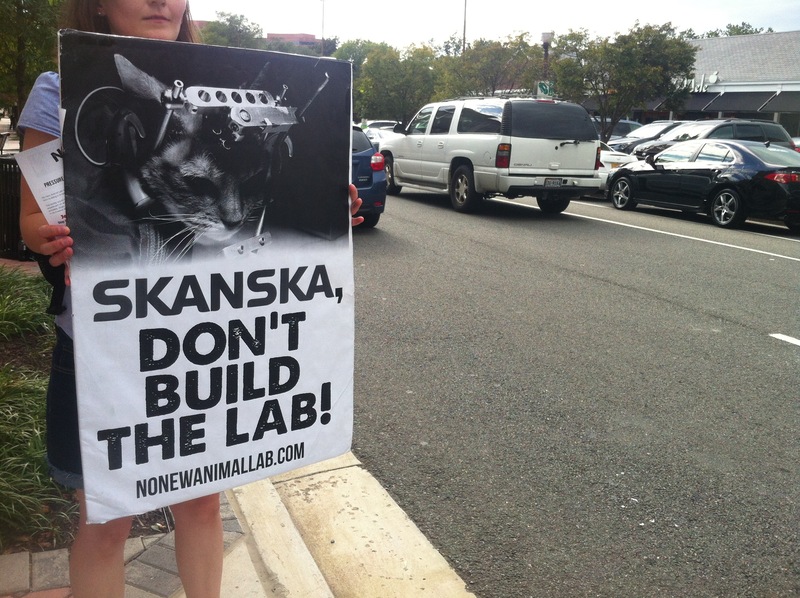 The following day we again joined up with DC Stampede, this time to protest at Skanska’s Arlington, VA, offices. 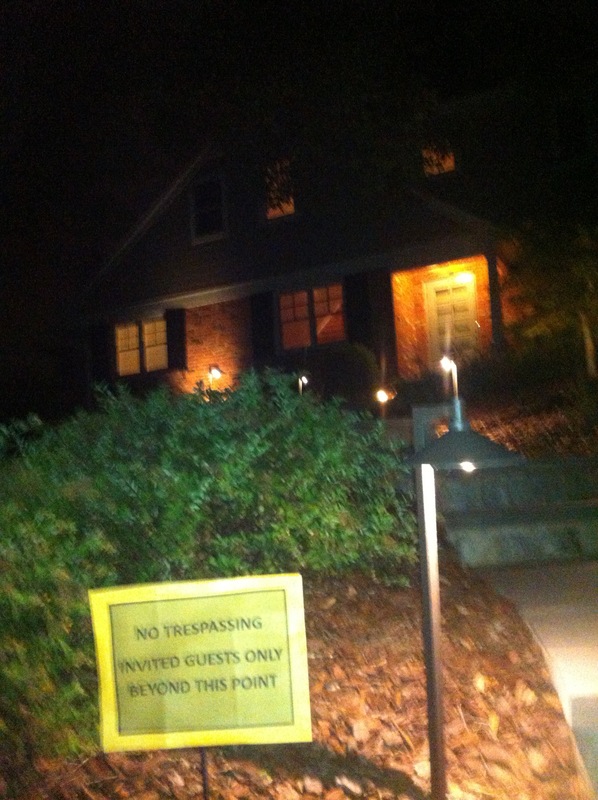 Following the office demo, another group of us headed to Oakton, VA, to the home of Amando Madan, EVP Skanska ID, 2955 Bonds Ridge Ct., Oakton, VA. We went straight to his doorstep, rang his doorbell, and knocked repeatedly–only to be met with silence. The protest started nonetheless. He was in fact home and pretended to hide until his adult son made an appearance. He was quickly reprimanded by Amando for blowing his cover. 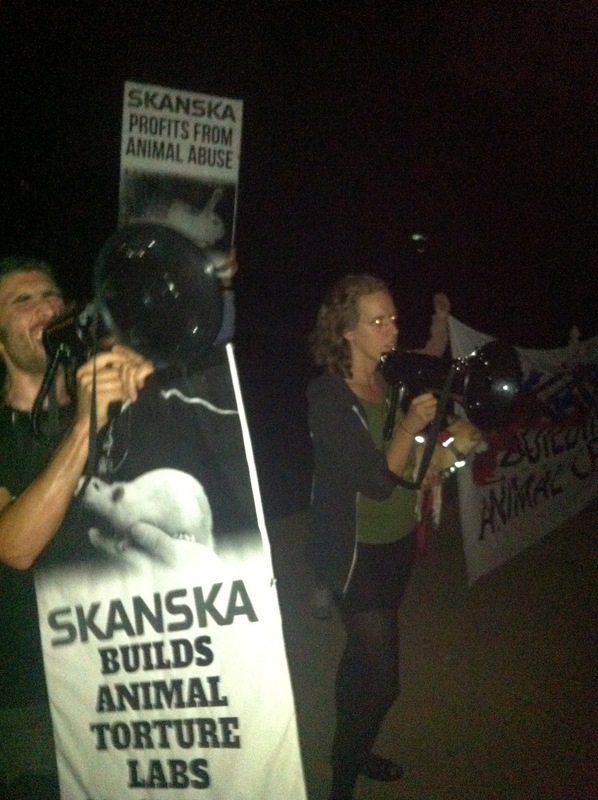 His whole cul de sac and street could hear us as we protested animal abusers in their neighborhood. 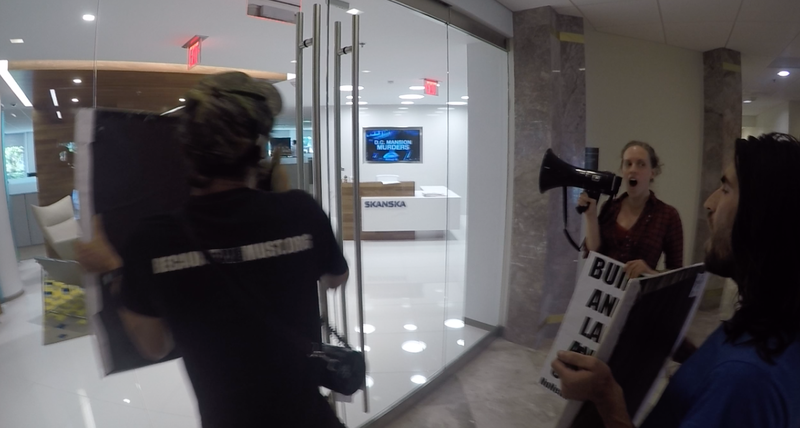 We followed Amando up with Christopher Cardinale, Senior Vice President and General Counsel at Skanska, who lives 4105 N Richmond St., Arlington, VA. Christopher was already prepared, using his Skanska-issued “No Trespassing” signs in a failed effort to deter protest. Protest commenced regardless and neighbors came out to see the commotion. We left DC the next day to head to Philadelphia for a presentation at Grindcore House, where we met warm and welcoming hosts. It was raining that day in Philly, but that didn’t stop a crowd from heading out to the homes of Skanska executives that evening. First stop was Edward Szwarc, EVP/GM for the region, at his residence at 604 Dunburry Dr., Ambler, PA. In anticipation of our visit, Edward had decorated the face of his home in Skanska no trespassing signs, one even dangling in front of his door. Like most of his fellow executives, Edward thought that turning his lights out would be useful. He was wrong. We began a very loud demo in front of his home and he was forced to make an appearance–albeit behind the flash of camera. Bill Sahwell’s home, at 101 Darter Ln., North Wales, PA, was the next lucky stop of the NNAL Tour. Bill is an SVP and Account Manager for the Philly area. It was late, so Bill was likely sleeping. Worried that he may sleep through our visit, we decided to wake him up. The protest started and ended on his porch and we felt certain that we were loud and boisterous enough to have left an impression. Hopefully it was a night to remember. DC and Philly mark out last stops before heading to NYC–Skanska USA’s national headquarters and the home base of nearly all of Skanska’s top executives in the country. 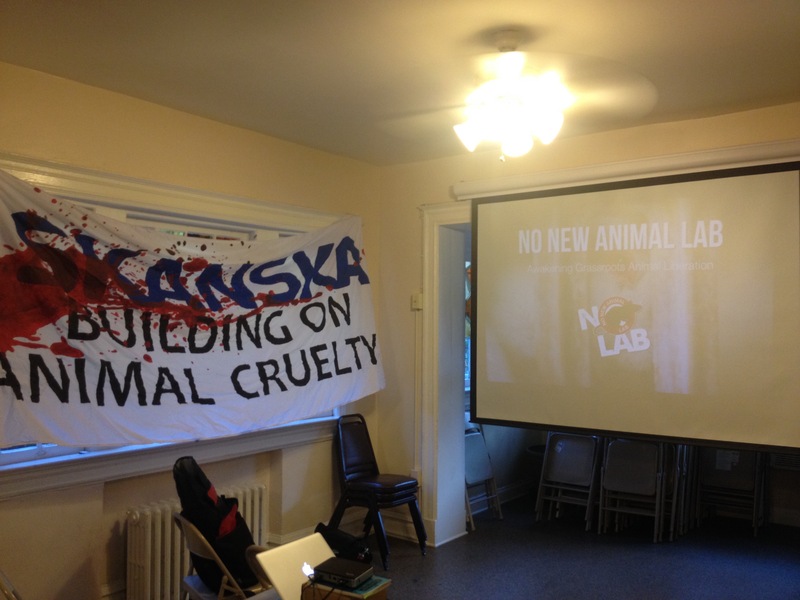 We thank activists in both DC and Philly for the fun time in preparation. It was a great send off.